Okay, actually not really at all, I was just trying to find a good way to intro my latest obsession with Thyme and trust me, it doesn’t punish me at all. I have been adding the fresh herb to just about everything lately. And when I added it to these Sweet Potato Noodles, it changed them from wow, to WOW. Sometimes I feel like I forget what fresh parsley or dill, or any herb for that matter does to a dish. So I am going to be growing many more of them this summer. Having them in the backyard on hand at all times makes extra flavor right at your fingertips. 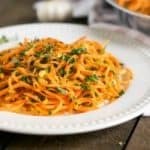 This was my first try at Sweet Potato Noodles. It is very far from my last! For me they were even better than zucchini noodles and mainly because they don’t seem to have the same likelihood of becoming water logged like ‘zoodles.’ The flavor was also a completely different experience so maybe it’s not quite the best to compare. I just absolutely loved these. I added some freshly grated parmesan and ate these straight after the photoshoot and then again later on for dinner. I just so happened to make them again two days later. So if you are wondering if this recipe is a keeper, I did the work for you already! Frozen chopped spinach is always on hand in my freezer. I also freeze fresh chopped spinach if it is about to go bad in the fridge. So every so often I have to weed out all the extra spinach in the freezer. This recipe helped the cause! Feel free to have this as a tasty side or enjoy as a meal! 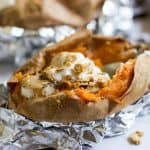 Leftovers are only going to happen if you double or triple the recipe I imagine, so be prepared! 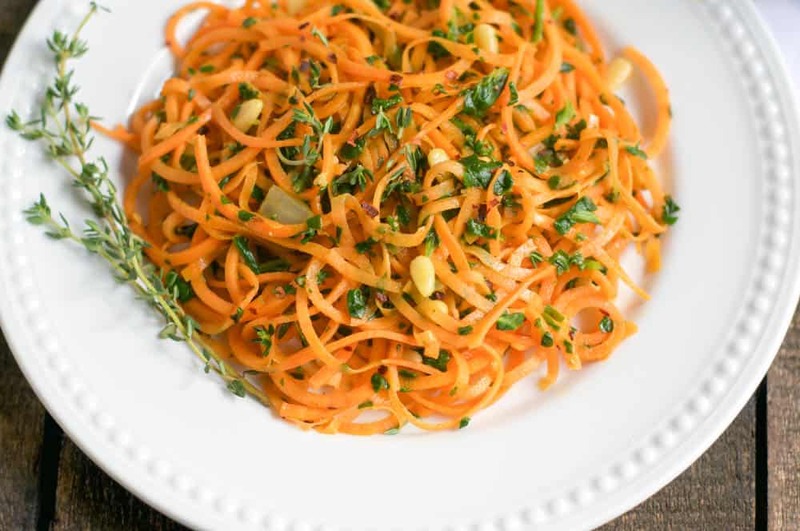 Using your spiralizer tool, spiralize the two sweet potatoes to the spaghetti like setting, set aside. In a medium skillet, heat one tablespoon olive oil over medium high heat. Heat garlic and onion until onion becomes soft and translucent. Add in pine nuts and leaves/needles from the thyme sprigs and stir/toss to combine. Add another tablespoon of olive oil if desired and serve immediately with extra thyme on top if desired.